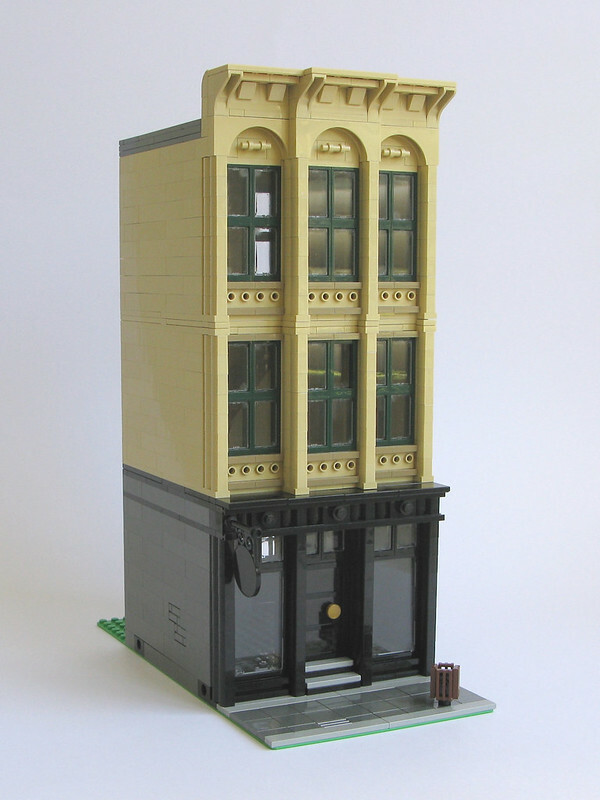 The Cast Iron Modular was one of the eight 16-wide modular buildings that made up The Promenade that I displayed at BrickWorld Chicago in June 2015. As the name suggests, it was inspired by the cast iron buildings found in New York. I never finished the interior for this building. 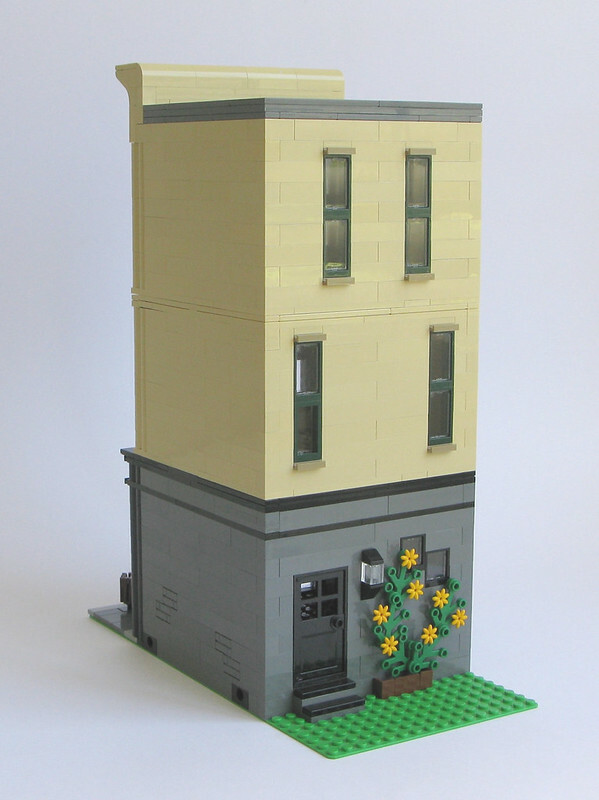 By the time I got to this point, I had built it four times – the original build, the test build for the instructions, the build at BrickWorld and the final build for the images above. I must admit that I needed to move on! Given that the name is always inspired by the interior (at least for me), this building also doesn’t have a proper name. There are more images, including of the relatively bare interiors, on Flickr. This is not a store, it’s a bar! With pool tables upstairs and who knows whats going on on the top floor! Great design, simple but classy! A good idea, but I have done a bar recently (Trilogy). I have been inspired though to do something with the interior and have an idea! Quick question, do you know if it’s possible to do the black section in red or green? There are not the full complement of parts required to do it exactly the same in either green or red, but it could potentially be done with substitutions. For a red version, the missing piece is the 1×2 log / palisade bricks, but these could be substituted by a column of 1×1 round bricks with plain 1×1 behind them. For a green version, the 1×8 door rail plates are rare in green. There are 1×2 door rail plates available in green, but there would need to be some remodelling done because the top of the black part won’t be supported if you simply replace the 1x8s with 1x2s. 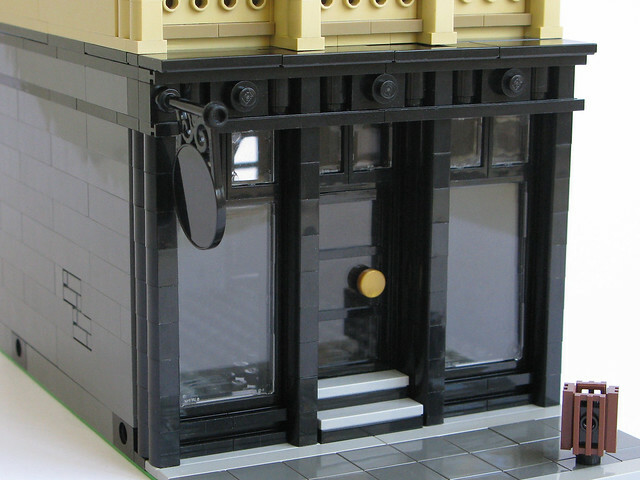 You would also need to find an alternative for the window / door frames, as the 1x4x6s aren’t available in green. Let me know if you do a different colour version as I would love to see it. Love your work. The proportions are great and the detailing is just the right amount. Thanks for inspiring! I’m sorry, but I no longer sell instructions for my models.